Without doubt the most popular area of Seoul for foreign visitors, the gritty neighbourhood of Itaewon is one of Korea's coolest and most cosmopolitan urban enclaves. Located near the US army base in Seoul, Itaewon is full of great bars, restaurants, clubs, and shops. Shopping in Itaewon is a unique experience, selling anything from fine tailored suits to cheap plastic jewellery and extremely rare vintage records to American football jerseys. The area is also celebrated for its wide range of restaurants. Aside from fast food joints and galbi restaurants, people can tuck into French cuisine, fine Indian and Pakistani curries, and thick steaks and racks of barbecue ribs. 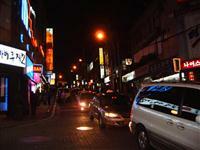 As wonderful as Itaewon is during the day, it comes alive at night. Travellers will find an inexhaustible selection of clubs, bars, discos, karaoke rooms, and live music venues. Some of these are very upmarket and feature international DJs, while others are pretty seedy. An exciting and edgy neighbourhood, Itaewon is the perfect base for young visitors looking for an unforgettable big city experience in Seoul.